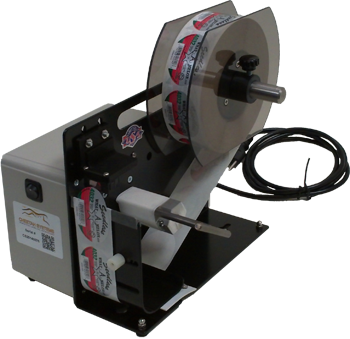 The Cheetah "ULTRA" ACd01 Automatic Label Dispenser - Ultra fast, simple, affordable, functional, and dependable. Ultra fast, simple, affordable, functional, and dependable Heavy duty 120 VAC automatic label dispenser, designed to dispense most self-adhesive labels such as: paper, foil & small irregular shapes. Will dispense labels from 1" to 6" long and .5" to 2.5" wide at 5 inches per second. No tools are required for label size changes. Will Accommodate an 8 inch O.D. Label Roll with 3" Core. Dimensions: L 11" X W 7" X H 8.5"
For inquiries please call 727-217-6719 or email us at sales@cheetahsystemsllc.com.